Cora loves to play with her rubber duckies, fish, and other toys during her bath. Tonight was no exception. As I started her bath, I walked into her room to get her other ducky. I could see her head the whole time I was away from the tub, so I wasn't concerned about leaving her for just a few seconds. 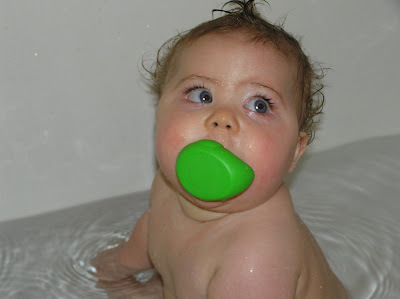 When I went back into the bathroom, I noticed her green rubber ducky was missing. I looked around her small tub and still didn't see it. She was playing so quietly with her other toys and didn't seem to care that her green ducky was now missing in action. I asked "Where's your green duck, Cora?" She continued playing, not paying me a bit of attention. I asked again "Cora, where's your green duck?" This time, she looked up at me. In place of her sweet little rose bud mouth was a big green duck bottom. The whole head was inside her mouth. She looked as if she were wanting to say "I like this paci, Mommy". Thanks, Geron, for posting the new pictures! Love you all.